The BBC is rolling out new features on the iPlayer today, as part of its drive to 'personalise' the user experience. 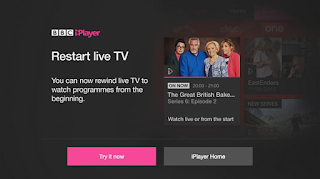 Live Restart on Connected TVs* - the function, already available on other versions of iPlayer arrives on connected TVs. allowing you to go back to the start of the programme currently showing - handy if you've just missed the start of a programme, and all without the need for BBC One+1, recently stopped from launching by the BBC Trust. Cross-device pause and resume – cross-device resume lets you watch a programme on one device and seamlessly continue watching on another. The BBC says: "Sign in and catch up on EastEnders on your mobile in the morning and continue from where you left off on your computer in work on your lunch-break." My Programmes - Sign in on the website and/or app and find the shows you’ve favourited, programmes you’ve started watching but not finished, and the next episodes of that series – all in one place for you to enjoy. The BBC says that in future, "My Programmes is somewhere you’ll also find other programmes we think you might like to watch." BBC iPlayer has also recently updated its mobile apps with a brand new look and feel, making it even easier to enjoy the latest drama from Walford or interrogation from the Dragons in the Den when out and about. Audio Description (AD) functionality is now available on iPlayer on TV platforms - as well as computers, mobiles and tablets. “This raft of new features promises to give users even greater control over their iPlayer experience, ensuring they’re never late for a BBC TV broadcast again and providing easy access to the programmes they’re enjoying on BBC iPlayer whether at home or on the move”. * Initially YouView, Roku, NOW TV, Amazon Fire TV, Xbox One before rolling out on other devices/smart TVs with the BBC iPlayer App and live iPlayer streams (i.e. not Sky, where iPlayer is part of Sky's on-demand function).